Winter never seems to put a chill on outdoor fun for kids. With an ability to brave the wet and the cold, many youngsters seem to be in their element when winter blows in. Even the less intrepid can find themselves lured outside by the enticement of freshly fallen snow. During the Winter Olympics year, children may find more reasons than ever to seek winter fun outdoors. A sledding hill can become a field of dreams for kids inspired by bobsled and luge teams. Graceful figure skaters and fearless ice-hockey players can stir other youngsters to lace up ice skates and conquer their wobbly ankles. Weather patrol: It’s a cold day and yet your child wants to dash outside to play. You, in turn, may need to put on the brakes. Carefully evaluate the weather conditions before allowing your kids to go outside, and check weather broadcasts for reports on precipitation and the wind-chill factor (the temperature you feel, not the air temperature). Kids playing outside may not realize how cold they are getting, which exposes them to potentially dangerous health conditions such as hypothermia. Ill winds: Be on guard for two particular dangers from overexposure to the cold: frostbite and hypothermia (when the body’s temperature falls below 95 degrees). Symptoms of hypothermia, which can be a life-threatening condition, include shivering, clumsiness, slurred speech, confusion, and drowsiness, according to the Mayo Clinic. Frostbite can occur quickly on fingers, ears, nose, and even cheeks and chin. Watch for skin that is red, white, pale or grayish yellow, and other skin symptoms such as numbness or burning. Gearing up: Winter demands the right clothing for your kids, which means dressing them in layers and protecting extremities that are vulnerable to the cold. The American Academy of Pediatrics advises starting with fabrics close to the skin that guard against moisture, and then adding layers of clothing that assure warmth but not restrict movement. Waterproof pants and jackets can be terrific top layers. Protect little fingers and toes with gloves and boots, topped off with a warm hat that covers the ears. Don’t forget the sunscreen: Another winter safety tip that’s often overlooked is wearing sunscreen. Parents need to protect their children’s skin outdoors, no matter the time of year, advises the American Academy of Dermatology. Winter sun can be very strong, especially in areas at higher elevations, and as the sun’s rays reflect off of snow. Rosy cheeks are nice, but not if they come with a winter sunburn. Drinking and snacking: Kids need to stay properly hydrated for active outdoor play, and being physically active can significantly increase a child’s hydration needs. It’s a good idea to have youngsters drink water, milk or juice before heading out to build a snowman. An alternative can be snacking on foods with high water content such as fruits and vegetables. Also, you might consider placing small snack bags into their pockets. A healthy, homemade trail mix to try: dried cranberries, blueberries or raisins, slivered almonds, and pumpkin seeds. Sports wonderland: Your child needn’t be an Olympian to enjoy sledding, ice skating, skiing, snowboarding, ice hockey, or other winter sports. What’s important is to take common-sense precautions. For example, make sure that your children wear helmets and other protective gear when necessary. If your child goes sledding, know the hill. Make sure the grade is not too steep and that the path is free of dangerous trees, boulders or other obstructions. Have your child avoid hills that end near a street or parking lot. If your youngster wants to ice skate, select an indoor rink, which isn’t dependent on outside weather to stay frozen. 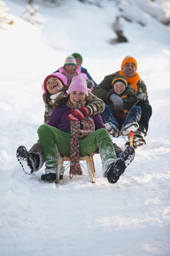 What other winter safety tips do you and your kids adhere to? Share them in the “Comments” section below.